Glorious Forest Farm isn’t just a farm or living lab. It’s a family project, as the Brown’s truly work towards establishing something sustainable that will be passed down to their children. Using a holistic management framework, each enterprise they explore fits into the land capacity and their desires for their personal life. 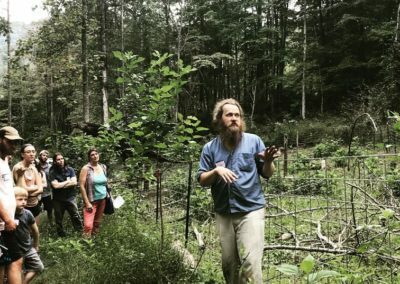 WNC CRAFT had the opportunity to visit Osker Brown and Glorious Forest, in a partnership with The Appalachian Beginning Forest Farming Coalition, to check out their silvopasture techniques. 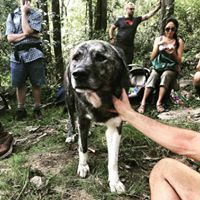 Silvopasture, now also known as agroforestry, is the practice of combining woodland (trees) and the grazing of domesticated animals in a mutually beneficial way. Advantages of a properly managed silvopasture operation are enhanced soil protection and increased long-term income due to the simultaneous production of trees and grazing animals. The trees are managed for foliage, fodder and, at the same time, provide shade and shelter for livestock and some forage, reducing stress and sometimes increasing forage production. 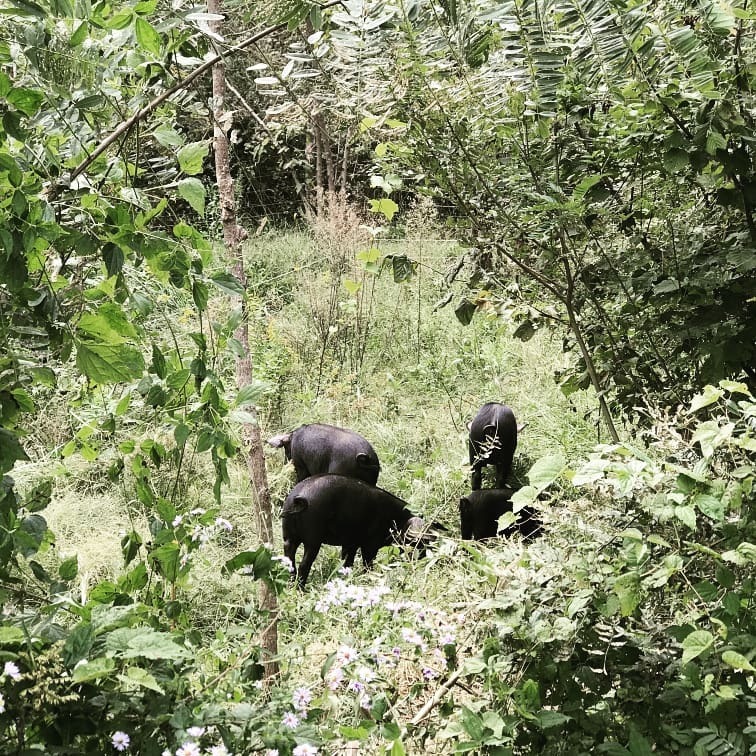 Perhaps the oldest agroforestry system used in the temperate regions of the world, silvopastoral systems are characterized by integrating trees with forage and livestock production. 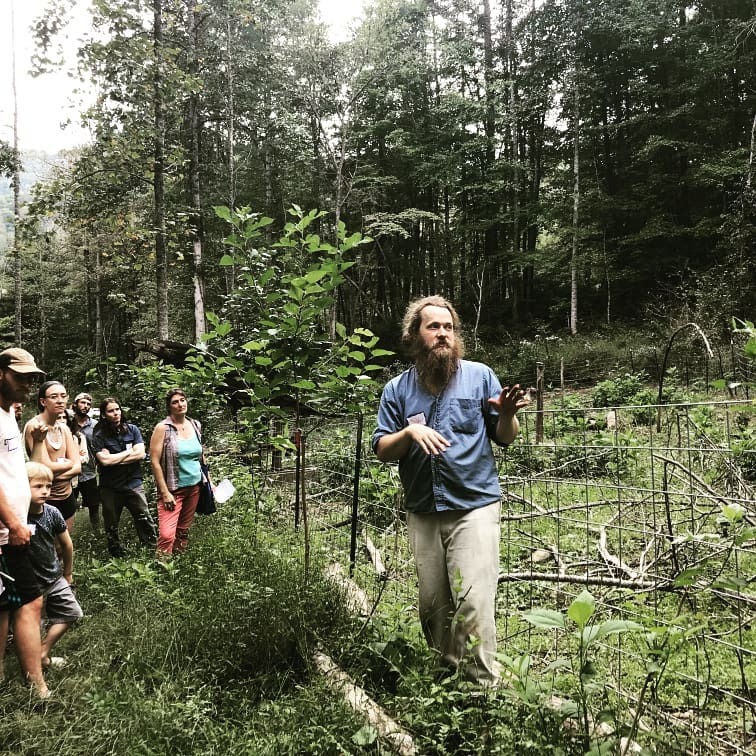 Such systems have the potential to increase agricultural production in the long term, especially in areas (such as the Southern Appalachians) where so much of our affordable land is wooded. Truly a forest wonderland, Glorious Forest is nestled in a holler in Mars Hill, NC, on almost 100 acres of land, almost all of which is forested and sloped. This has meant being very much forced to work with what the land has to offer, which is what Osker and his family enjoy doing most. From selective logging to pasturing animals in and among the trees, the Brown’s have worked the land to work for them. 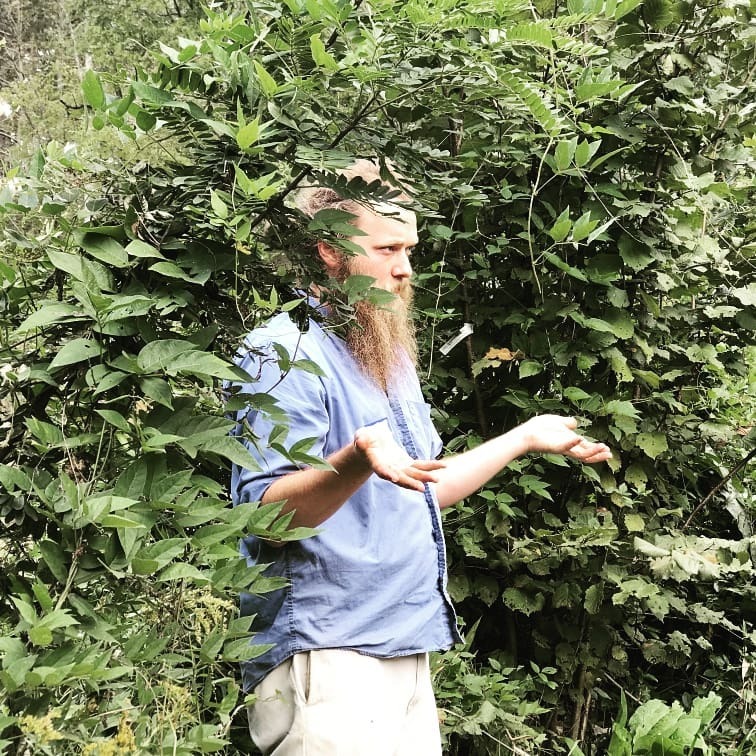 Although the family and their farm practices are deeply rooted in permaculture principles and primitive skills, the land has gone “beyond permaculture” as Osker has continued to explore what makes most since both financially and for the land. They have been on the land since 2013; “My lack of farming experience meant that I didn’t have an idea of what any of this ‘should’ look like,” Osker explains, “Which means a lot of open doors for trying things.” With a mixture of value-added products, his partner’s Apothecary business, and Osker’s experiments with livestock breeding, they’re getting to know their niches and where to plug into the local farming community. Last year, they tried to sell acorn-finished pork, which, they quickly learned, was hard to do at a price point necessary to break even. 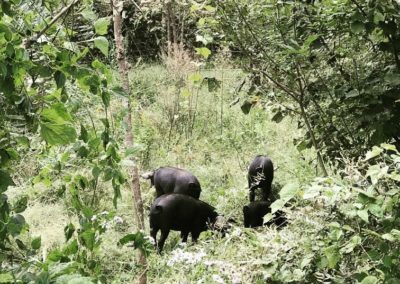 This year, Osker is continuing his passion with pigs, but has moved to selling piglets that are selected to survive on forage. “If you choose from the traditional pig breeds, they often have much difficulty gaining weight purely from forage. So it’s been a process of selection and breeding, but I’ve finally developed piglets who will gain an adequate amount of weight without supplemental feeding, and I am working towards speeding up when they can be slaughtered by,” says Osker. He has a core group of 3 breeders that have been selected specifically for this ability. Another project they had tried out followed Osker’s other passion for nut trees. They worked to sell acorn flour, “But, you can’t already buy acorn flour on the shelves, so how on earth did I think I could sell it?” Osker chuckles, and describes that eventually they turned to a value-added acorn flour cookie for selling at the market, which they can’t sell enough of. This type of experimentation has been key in developing their farm markets. Osker is also passionate about hazelnuts, for their massive amount of food production, nutritional content (60% fats, and very high in oleic acids), and ecological sustainability for our region. 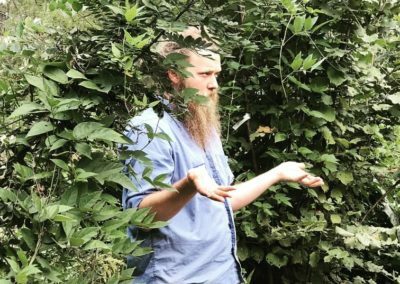 He has been, slowly but surely, selecting wild hazelnuts for size, and has a goal to get hazelnuts into as many landscapes as possible in Southern Appalachia. Part of the hazelnut conundrum is that you need to have a lot of them, as they wind pollinate. Osker recommends a stand of at least 20 trees for adequate pollination; they will produce in about 4 years from planting. A diverse stand means higher disease resistance. The Eastern Filbert Blight, which is a threat for a lot of commercial hazelnut varieties, will affect wild hazels but not kill them. The commercial hazels have no resistance, which is why they are not grown widely in out area. Oregon State University has bred some varieties that are blight resistant, but Osker swears by selecting the wild varieties for this reason. Hazelnuts native ranges are Arkansas to Canada, and so our regional temperature differences mean that hazels flower in the early spring. Most of the propagation of hazelnuts happens by seed, but you can also do root propagation for cloning. Over the next few years, he plans on working to breed and distribute plants for communal breeding efforts. Another value of having trees on the property has been the ability to store summer leaves for winter hay crops for the animals. 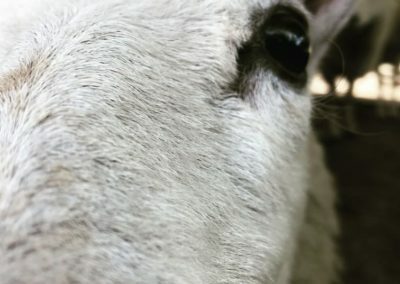 Currently, Osker only has sheep and pigs on the land, though previously he’s experimented with geese, chickens, and goats. The sheep he works with are a Iceland/Chevoit cross which he gets from a friend in Shelton Laurel. They are three years old and have never been de-wormed, which speaks to their heartyness and ability to be on forage. He can slaughter them at 5-6 months and gets about 60-80 lb. carcasses. He also grows his pigs (after moving them through his hazelnut stands 5-6 times over the year) for about 10 months April through January, and usually gets about 300 pounds of meat. Other crops that Osker uses for both animal feed and ground cover include Apios (a nitrogen-fixing legume), false indigo, black locust, hackberry, comfrey, and black raspberry. “When you look at a forest, it’s all about the photosynthetic surface area. You can really think of it as a sun sink, so every horizontal surface you have as you look from the top-down that hits sun is harvesting the energy to transfer to the animals who will eventually feed from those plants, and therefore, be able to use that energy” describes Osker, gesturing around the various levels of the forest canopy around us. 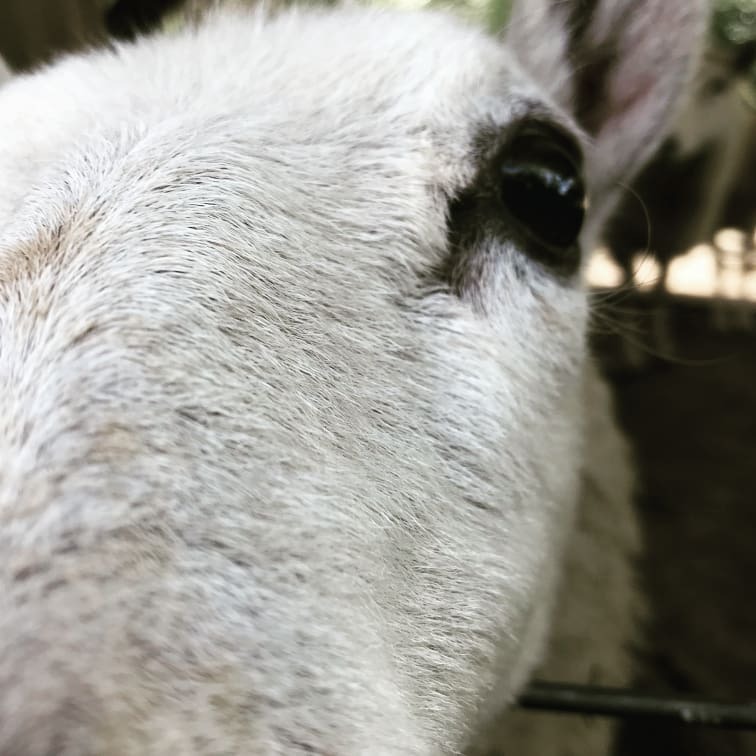 Thanks so much to Glorious Forest for hosting us on this farm tour. We look forward to returning and seeing your new projects!